GAC Pindar welcomes two new faces in Britain's Chris Draper and Japan's Kazuhiko Sofuku to add valuable experience when the Extreme Sailing Series fires up in Cardiff over 18-21 June. Draper will co-skipper Team GAC Pindar with Australian 18ft Skiff winner Seve Jarvin, while Extreme Sailing Series regulars James Wierzbowski and Tyson Lamond complete the crew. Draper won the Extreme Sailing Series in 2009 with Oman Sail; and his tactical prowess should prove invaluable for Team GAC Pindar ahead of their home event of the Series. Draper won a bronze medal at the Athens Olympic Games (2004) in the 49er class, was crowned World Champion twice in 2003 and 2006 and European Champion three times (2004, 2005 and 2010) in the same class and was helmsman for the Luna Rossa America's Cup challenge for the 34th America's Cup. Sofuku – widely known as ‘Fuku’ on the circuit, will be a real asset to GAC Pindar in advance of joining Softbank Team Japan in the 2017 America’s Cup. ‘Fuku’ is a four-time veteran of the America’s Cup and was a key crew member for Peter Gilmour’s World Match Racing Tour championship victory in 2004/5. 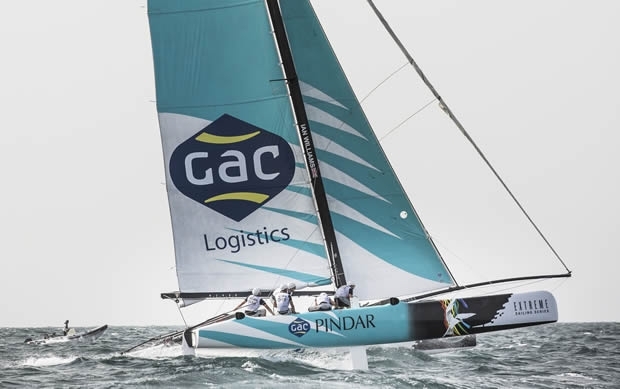 GAC Pindar Team Principal Andrew Pindar adds: “We haven’t quite been getting the results we’ve wanted, so we’re experimenting with a few changes. Adding more experience to the crew with Chris and ‘Fuku’ should help us achieve our true potential. Cardiff saw us achieve our first race victory of the 2014/15 season and five further podium finishes, so we’re hoping for more positive results at our home Act.